After concentrating on the DVD market in recent years, Retro-Speedway have published a new book (just) in time to catch the Christmas market. 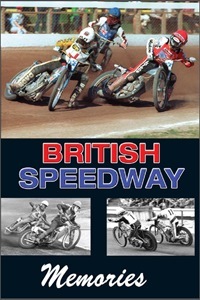 British Speedway Memories is their latest publication, a compilation of great tales looking back over years gone by. The book was compiled from hundreds of surveys completed by fans and other speedway personalities over the summer. There are a few former riders included, but this is largely a book 'by the fans, for the fans'. Editor Tony McDonald leads us into the book with a chapter of his own cherished memories, starting with childhood reminiscences from Hackney and moving on to reflect on how fortunate he's been to meet many of his heroes through his professional involvement with the sport. Thereafter the book takes a slightly different form, mixing up contributions from different people into themed chapters, rather than telling each individual's full speedway history in one block. This approach works well, allowing the editor to cherry-pick the best of the surveys rather than merely reproducing the whole thing verbatim. The sections on favourite riders and tracks often see the same names and places come up, but the different perspectives offered by the contributors mean this isn't a problem. There are also a few seemingly unlikely choices thrown in, demonstrating that everybody's tastes are different and that speedway offers something for everyone. Similarly, 'favourite meetings' throws up a wide range of different events - from classic World Finals to run of the mill National League meetings at Scunthorpe. Some of the tales will be familiar, others much less so, but clearly all still fondly remembered by those who were present. The book spans virtually the sport's entire history in Britain, contributor Bert Loader having been present at Midlands meetings in 1930, while relative newcomer Maurice Plowright can 'only' trace his own personal speedway history back to Eastbourne in 1932. Maurice worked on the Arlington track staff right up until the start of WWII and has fond memories of watching the likes of George Newton, Rube Wilson and Bob Lovell. He also recalls Bluey Wilkinson signing his autograph book, rather disappointingly signing as 'Arthur' rather than his more colourful nom de plume. 'Then and Now' allows the contributors to offer suggestions on how to reshape the sport for the better, principally by bringing back something from the past. While it's debatable that reintroducing second-halves or tactical substitutes would transform speedway's fortunes, there's a palpable frustration that, in many respects, today's speedway is a pale imitation of that in years gone by. The 'Why Speedway is Special' chapter is much more uplifting, really highlighting what speedway has meant to people over the years, how much pleasure can be derived from it and how loyal speedway supporters can be. Even those that are slightly disillusioned with the sport can't quite give it up entirely. A book with so many contributors should have a ready market from those who feature in it, but there's more than enough in here to appeal to the speedway community in general. Fans will enjoy reading the experiences of others and will undoubtedly recognise many parallels with their own. Promoters might like to read a copy also, you can never know your customers too well and there's plenty of food for thought in these pages. The book is beautifully illustrated throughout by photographs, magazine scans and programme covers. There's also a selection of colour photographs of some of the sport's legends in a 32 page appendix at the back of the book, starting with Barry Briggs and ending with Tai Woffinden holding the World Championship trophy in 2013.